The Wai Khru ceremony takes place in schools, colleges and universities throughout the Kingdom on any Thursday in June. 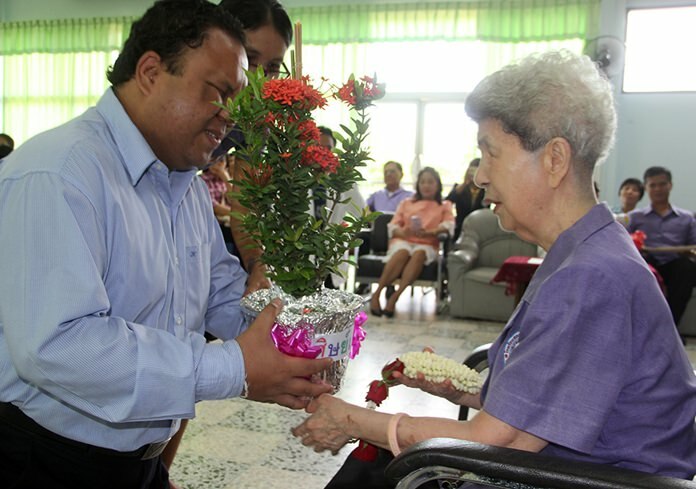 Throughout the month, ceremonies where students pay their respects to their teachers took place at several projects managed by the Father Ray Foundation, including the Redemptorist Vocational School for People with Disabilities and the Father Ray Day Care Center. As usual the students presented their teachers with beautifully decorated floral ornaments, there was dancing, and students also received awards and scholarships for good work over the past school year. Bear pays respect to his teacher. 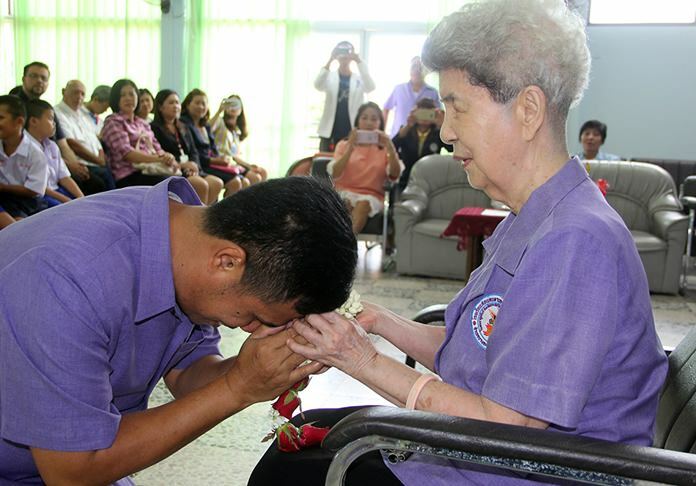 But on the final day of June the Wai Khru ceremony which took place at the Pattaya School for the Blind was a very special one as it also saw the retirement of the school’s founder and Principal, Aurora Lee Sribuapan. 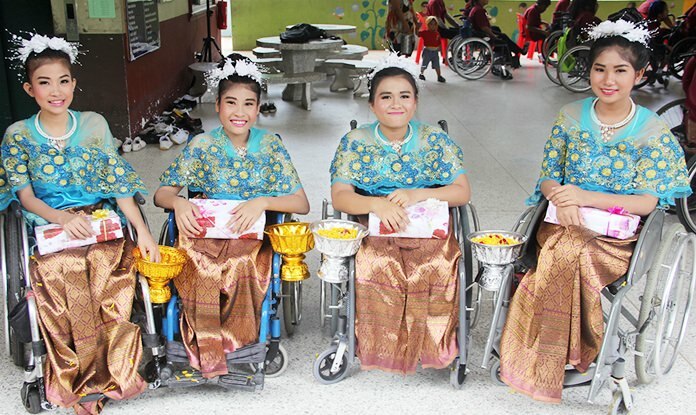 For more than thirty years Aurora, who herself is blind, has seen the school grow from a few rooms off Pattaya Klang, to the building of the current school located on Naklua soi 16. She has also witnessed the construction of a new vocational facility which is used to train blind and visually impaired people with new skills and knowledge so that they can find suitable employment. The new principal thanks the old principal. The school currently offers an education from kindergarten up to grade 9 to one hundred and ten blind and visually impaired children, and since it’s opening more than four hundred students have graduated. On Aurora’s final Wai Khru ceremony not only did the current students pay their respects and give thanks, but many former students traveled back to Pattaya to pay their respects. 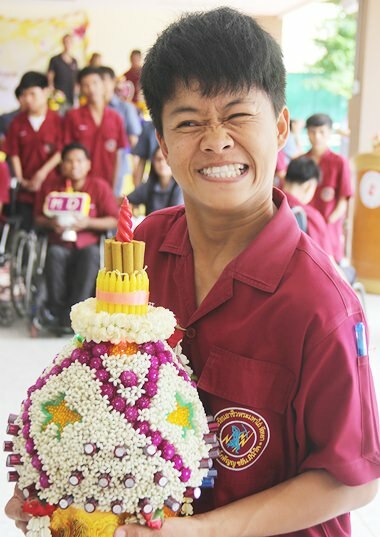 One young man who returned on Wai Khru first arrived at the school as a six year old; Aurora taught him English, she sent him to a local government school to finish his final three years, grades 10-12, before he entered the Faculty of Law at Thammasart University. Bear is his name, and he is now secretary general of the Foundation for the Blind in Thailand. 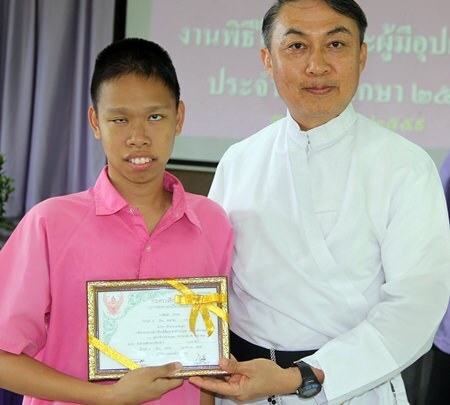 Father Peter presented certificates of excellence to the blind students. 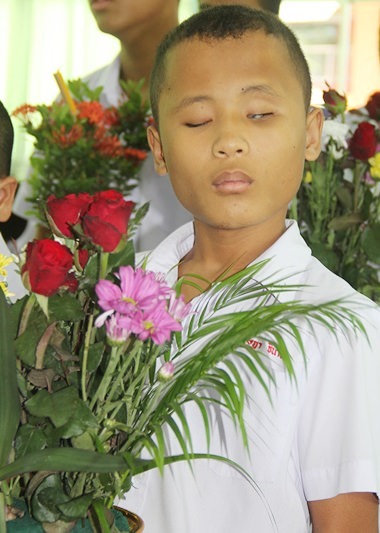 The new principal at the school is Khru Chitsukno, who is also blind and a former student at the school and, like Bear, he was also taught English by Aurora. Over the years many visitors have frowned upon ceremonies such as Wai Khru. They have said it is archaic, having children bow so low to another human being. Many have also said that they are glad their children back in the Europe and North America never have to do this, but surely there is nothing wrong with paying respect to that one person who is playing such a huge part of a child’s life. And can you imagine being blind or disabled and having no school to go to? Wai Khru at the Father Ray Day Care Center. It is seen as an honour to be selected to present flowers behalf of your classmates. 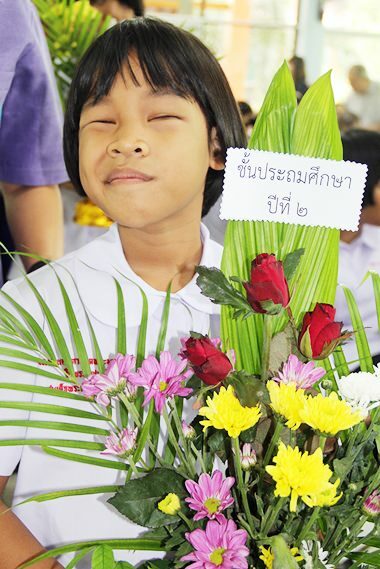 On Wai Khru Day, students present floral decorations to their teachers. 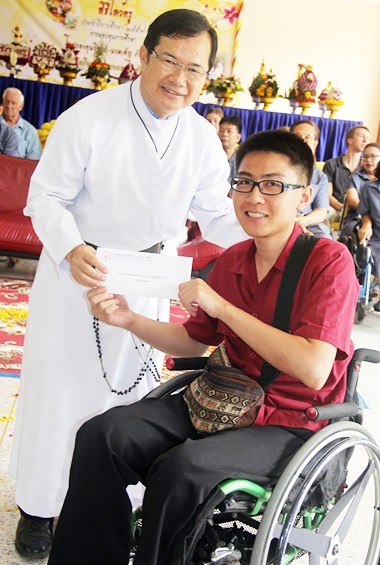 Father Michael presents a student with an award for excellence. The dancers at the vocational school.